Front subframe metal and welding info needed. 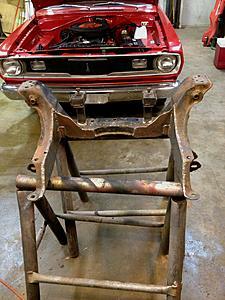 Widen a na subframe to the max to facilitate installation of Hedman mixmatch headers. 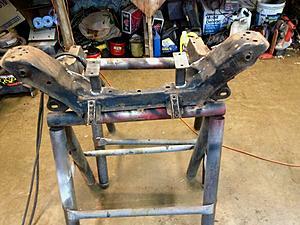 Anyone know for sure that the factory front subframe is non-heat treated mild steel? Anyone have comments on the best type steel for welding to the stock subframe? I've built a jig ala Mike CVX 20 and Stein. Bolted a factory front subframe to it and cut it to the max....the rear inside dimension is now 21.25" and the front is 22.5". The rear control arm mounts are basically just hanging on a whisper since I removed substantially all the subframe they were attached to. 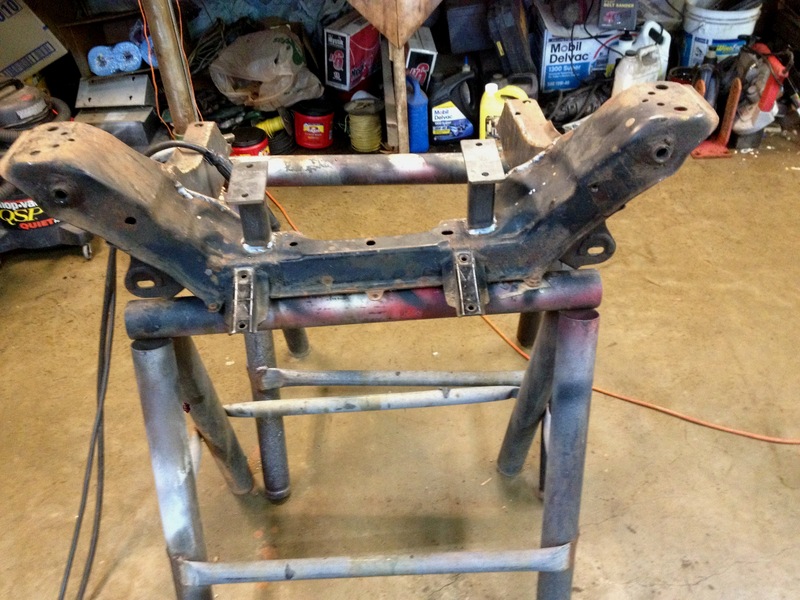 My plan for reinforcing or rebuilding the subframe is to use A513 1" X 4" 12ga. rectangular tubing or possibly 1" X 3" if I can't find 1x4. Reason for the A513 rather than the A36 mild steel I suspect most use is A513 has a higher carbon and yield strength (72,000psi vs 36,300psi for A36 mild steel). This gives it a greater resistance to bending and it is used in the automotive frame world. Anyone have comments on the type steel that's best in this application if I'm off in left field? I'll be welding with a Lincoln 175 amp 220v machine using .035 wire and 75/25 gas. I don't think I need to pre/post heat anything. My thinking with the rectangular tubing is I'll have a better looking, stronger/safer subframe when compared to what I could fabricate using flat metal only. Well, moving on with the project. Wound up using .125 plate, bolted the cut subframe up to the jig, welded in with my little175 Lincoln mig (75/25 gas, .035 wire). This was last fall. Spring forward to today. Finally, built and installed the motor mounts. Now clean things up, paint it up....clean the control arms and paint, assemble.......new oil pan gaskets, run valves.....install all in car. Since it's still on the lift it'll be interesting to see how sitting the car down on the engine assembly works. And then weld up the headers (change collector ends) build/mod exhaust system. Oh, I'm also moving the radiator forward a couple inches to allow for a pull through fan, and allowing the installation of a AC condenser. And finally, going to relocate the engine about 1/2" further forward, making it easier to access valve cover bolts (well actually nuts since studs are installed) along with the rear of the engine. Hopefully the small engine shift won't cause too much headache. We'll see. 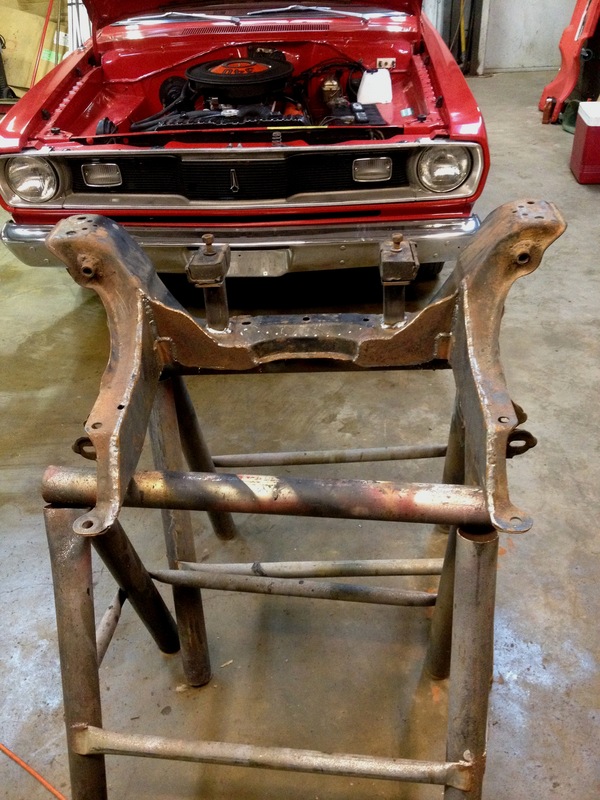 Quick Reply: Front subframe metal and welding info needed.